In most parts of Europe, England excepted, Valentine's Day is not celebrated to such a large extent as in the States. It is an imported holiday due to the influence of American culture, though merchants and the flower industry do everything in their power to spread it all over the world. It is more a commercial ploy than a holiday. In traditionally Catholic countries like France, Valentine's Day is known simply as "Saint Valentin", and is celebrated in much the same way as other western countries. "Saint Valentine's Day was first established by Pope Gelasius I in 496 AD, and was later deleted from the General Roman Calendar of saints in 1969 by Pope Paul VI." In many countries Valentine's Day has various versions of regional customs. In Romania, the traditional holiday for lovers is Dragobete, celebrated on February 24. See last year's Valentine's rose too. Śliczne walentynkowe zdjęcie. W Polsce wśród młodych to święto się przyjmuje. Pozdrawiam. *** Cute Valentine's Day photo. In Poland, among the young is a celebration to adopt. Yours. 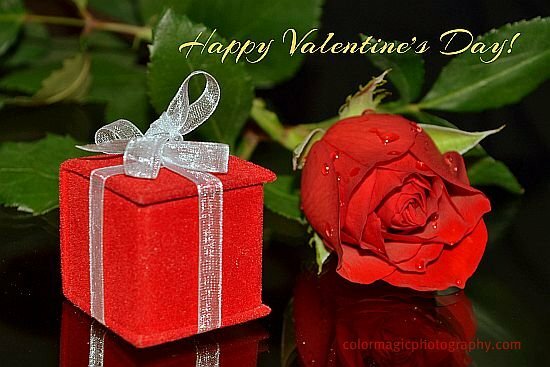 A beautiful photo, great photo work ..
A lovely Valentine scene, the rose is gorgeous. I like that other countries have not fallen into the commercialization of holidays the way we have here. Just wonderful ! Happy Valentine ! What a lovely photo! Great composition. Happy Valentines Day to you too.